We especially like to add lemon zest to give these a fresh zing, but they’re tasty with vanilla alone. 1. Whisk together the flour and salt in a medium bowl and set aside. 2. Using your mixer, cream together the butter and sugar until the mixture is light and fluffy. (If your mixer has multiple attachments, use the paddle.) Add the egg and vanilla and peppermint extract (and lemon zest if you’re using it) and mix until well blended. 3. With the mixer on low, gradually add the flour mixture to the butter mixture until the two are thoroughly blended. 5. 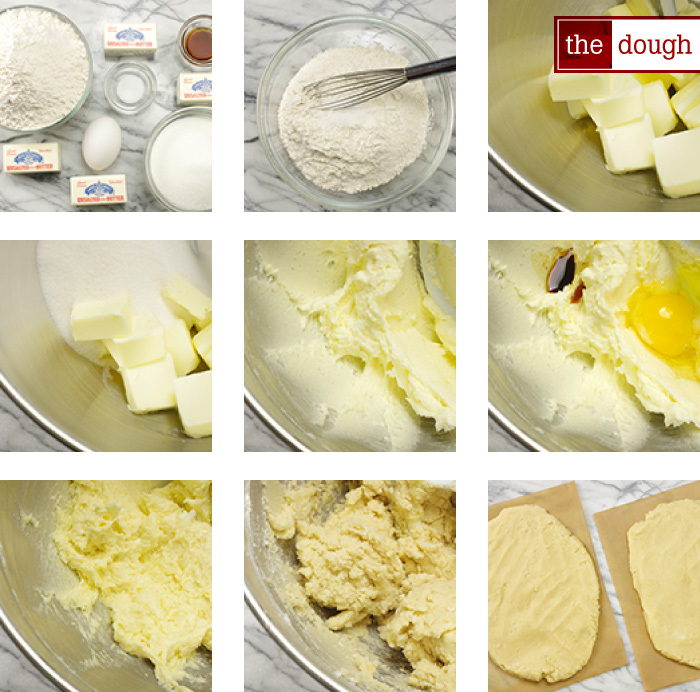 Turn out the dough onto the work surface and divide it into two or three equal portions. Form each one into a rough disk. Now you’re ready to roll, chill, and cut out the cookie shapes. 6. Preheat the oven to 350°F. 7. 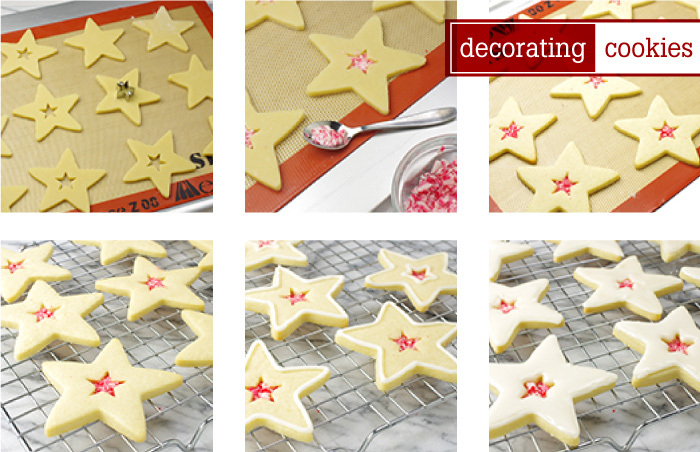 Place the star cutouts on the baking mat or parchment paper. 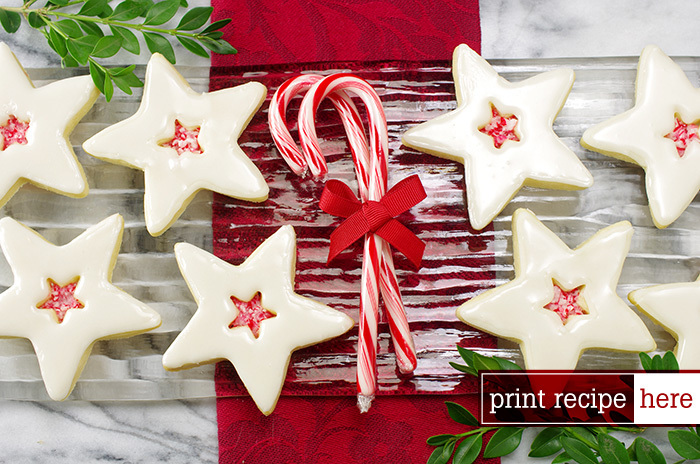 Using a smaller star-shaped cookie cutter, cut out the center of the stars. Carefully place crushed candy cane in the center of each star. Use a small brush to keep the candy cane dust in the center of the cookie. 8. Bake them in the middle rack of your oven for 12-16 minutes or until the cookies start to turn slightly golden around the edges (smaller cookies will be done more quickly). NOTE: If you decide to bake two sheets of cookies at a time, space your two oven racks evenly in the oven and rotate the cookie sheets halfway through baking (that is, switch the position of the top sheet and bottom sheet and turn both so that the front of each sheet is at the back to promote even baking). 9. Cool the cookies completely on a rack before icing or decorating. This simple icing works well for both piping and flooding on cookies. 3. Add additional milk a teaspoon at a time until the icing is mixed thoroughly, yet quite stiff. 4. Continue to add drops of milk until the icing is fluid, yet when drizzled on top keeps the imprint, piping consistency. 5. Remove two-thirds of the white icing to another bowl; place the remaining icing into a piping bag outfitted with a #4 tip for outlining the edges of the cookies. Check the consistency of the icing; it should be easy to pipe a line, and the line should spread just slightly, but more or less keep its shape. 6. In the other bowl, continue to add drops of milk to the larger portion of white icing until the consistency is more fluid for flooding. A ribbon of icing on the bowl should take 3-4 seconds to disappear into the surface. Cover tightly until ready to use. 1. With the white piping icing, outline the edges of the star’s center area and the outside cookie edges. Let dry for about 15 minutes, then flood the area with the white flooding icing. 2. Allow to dry for a few hours or overnight. Adapted and reprinted with permission from Cookie Craft by Valerie Peterson & Janice Fryer. Copyright 2007. Published by Storey Publishing, North Adams, MA.